Charlotte, NC's leading home staging and interior design company, Carolina Spaces, recently had the pleasure of assisting the homeowners of the historic home "Mint Hill" in Concord, NC with staging their home for sale. The owners of this 5,000+ sq.ft. historic home had previously listed the estate for sale twice, for a total of 462 consecutive days on the market with no offers. Joan Inglis, owner and lead designer of Carolina Spaces, was called in to help. She walked much of the 15.24-acre grounds and toured the main house and outbuildings with the sellers, making recommendations on what needed to be done to the interior and exterior of the property, including landscaping of the grounds, to prepare the estate for sale. Carolina Spaces was also brought in for hands-on staging of the main home, as well as providing appropriate furnishings for some of the vacant rooms. This Charlotte area historic home was listed after staging and multiple offers, including a back-up offer, were received! 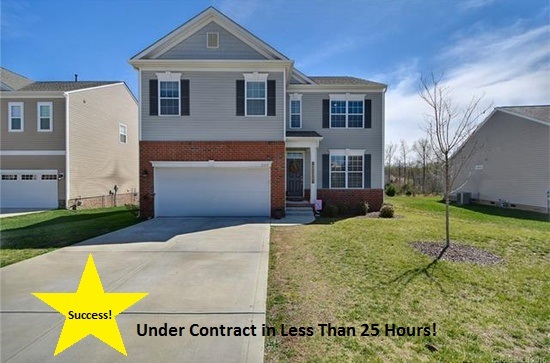 "Mint Hill" was under contract within 19 days for the full list price, and this after being on the market 462 days with no offers! Trust the knowledge and experience of Charlotte's leading home staging and interior design company, Carolina Spaces, with your luxury and unique properties. Don't risk wasting time and losing money on inexperienced or discount home staging providers. Carolina Spaces is a full-service Home Staging, Luxury Staging, Model Home Merchandising, and Interior Design firm providing Home Staging and Interior Design services to the Southeast. Our Model Home services are available nationwide. Contact us for more information on our award-winning services! Lake Norman HBA's 14th annual Best of the Lake Design Competition recently awarded Carolina Spaces Best Residential Interior Staging - Luxury Property over $1 million. Carolina Spaces has won the luxury staging award every year since the category was created for the competition. 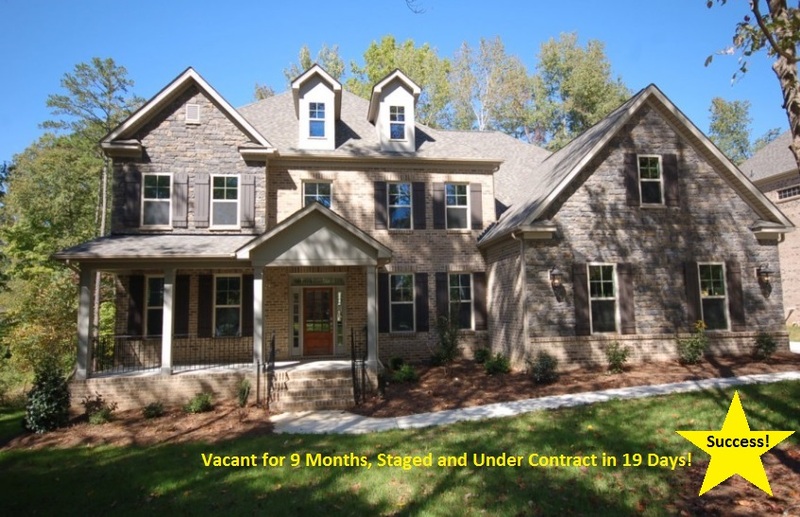 Carolina Spaces' award winning entry was a $1.6 million new construction, Waxhaw, NC property that sold for full asking price in 21 days after Inglis furnished the home. The home had been for sale vacant with no offers for eight months. "I am honored to be acknowledged as providing home builders, Realtors and home sellers the absolute Best in Luxury Staging in my region," said Joan Inglis, company founder, owner, and lead designer. "The Charlotte Region is catching onto the need for special marketing services for luxury properties. This includes real estate, advertising, photography, and staging," Inglis said. "Since the real estate market is currently hot in Charlotte, a lot of people are jumping on the luxury bandwagon claiming to provide these services. Carolina Spaces has always specialized in luxury properties and has worked in homes priced up to $10 million. We have furnished and helped facilitate the sale of over $1 billion in real estate since 2004," said Inglis. Carolina Spaces carries a full inventory of new, high-end, name brand furnishings appropriate for luxury properties. The firm specializes in designing with the proper scale, color, and style appropriate for each individual property. Carolina Spaces, the leading home staging, interior design, and model home merchandising firm in North and South Carolina, was featured in the Redfin blog "37 Home Staging Experts Share the Secret to Appeal to Buyers in Your City." Joan Inglis, Carolina Spaces' owner and lead designer, provided her expertise on how home builders and home sellers can appeal to buyers in Charleston, SC. The full blog can be viewed at Redfin.com. Joan Inglis has been featured dozens of times on TV, online and in print. 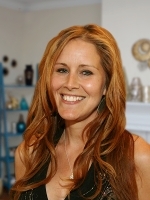 She has won numerous local, state, regional and international awards since forming her company, Carolina Spaces, in 2004. Carolina Spaces is the leading expert in Home Staging, Luxury Home Staging, Model Home Merchandising and Interior Design in the Charlotte, NC region and provides award-winning services throughout the Southeast. Call 1-855-SPACES-5 or Contact Us for more information. Home Staging Leads to Selling Success in Q1! The Carolina Spaces team saw our home staging services lead to many successful sales during the first quarter of 2016. With dozens of homes staged and sold, it was hard to highlight just one. So, we've picked our top three favorite home staging projects of the quarter! The Bronze goes to a Rock Hill, SC home staging project! The homeowner of this $224,900 property in Rock Hill, SC recognized the need for professional guidance to get this home show-ready. Carolina Spaces came in, toured the entire property with the homeowner, and created a step-by-step DIY home staging plan to show off the home's features and attract potential buyers. Home staging worked, and this property was under contract in less than 25 hours! The Silver goes to this Charlotte, NC home staging project! This stunning $674,900 new construction in Charlotte, NC sat on the market for 9 months as a home builder's vacant spec home. Feedback from over 200 showings all came back consistent - the family room was too small. So, Carolina Spaces was called in to help! We brought in our stunning inventory and staged the property, paying close attention to the family room. Buyers have a hard time visualizing size and scale in a vacant property (truly, only 10% can visualize the potential of a property! ), so we ensured that our staging showed room function and potential furniture placement. 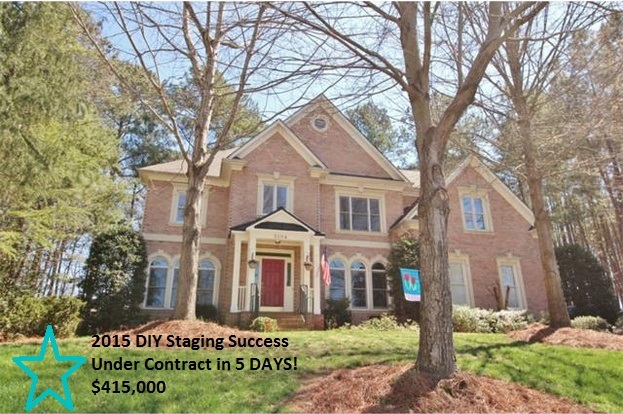 Our home staging worked, and this property was under contract in 19 days! 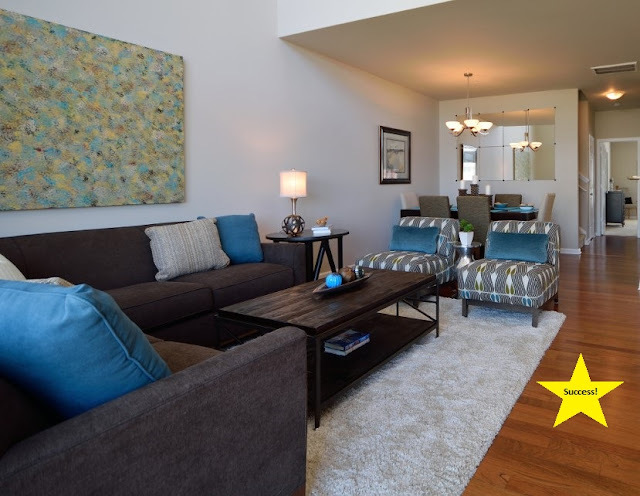 And...The Gold goes to this Charlotte, NC home staging project! Both the homeowner and Realtor of this $242,000 condo in the NODA area of Charlotte, NC understood the importance of properly staging a home prior to listing on the market. They trusted Carolina Spaces' full-service home staging to transform the vacant condo into an appealing space to the NODA buyer. 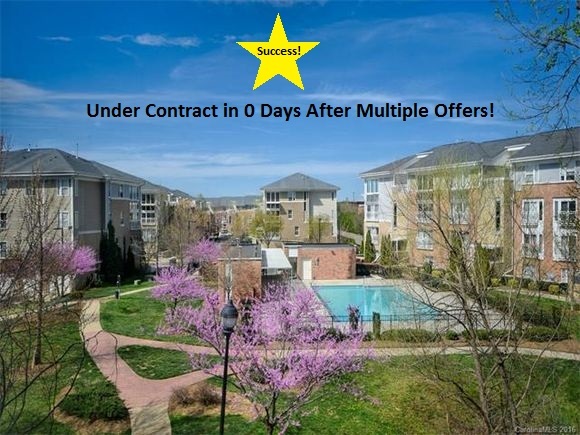 Within hours of listing, multiple offers poured in, and this property was under contract in 0 days! Carolina Spaces is a full-service home staging, model merchandising and interior design firm proudly providing home staging services to all of North Carolina, South Carolina and eastern Georgia. With a focus on quality, our team's award-winning home staging can help lead to your property's selling success. Call 1-855-SPACES-5 for more information. The numbers for 2015 are in and the Carolina Spaces team has picked their favorite projects! Tanya selected a beautiful home in a premier community in Lake Wylie, SC as her favorite home staging project for 2015. Carolina Spaces performed a DIY home staging consultation for this homeowner and provided a detailed plan for staging the property. With our professional staging recommendations and guidance, this home was under contract in 5 DAYS! If you're looking to stage your property on your own, obtaining professional guidance customized for your property is key. A DIY home staging consultation from Carolina Spaces includes recommendations tailored specifically for your property. Following our professional recommendations led to this property's selling success! 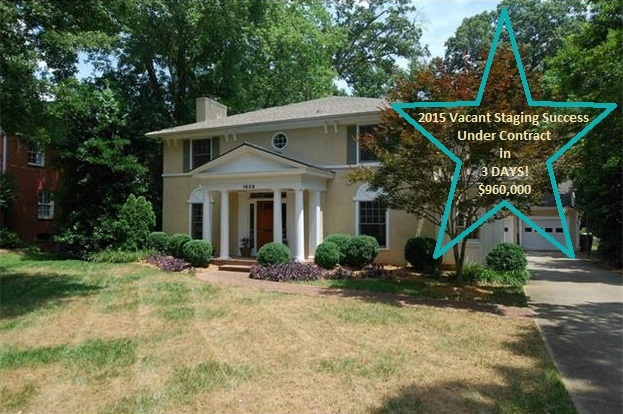 Joan selected a home in the sought after Eastover area of Charlotte as her favorite home staging project for 2015. This home sat on the market for 7 months as a vacant property with no offers and was taken off the market. Carolina Spaces came in and staged the property with our stunning inventory of new, high-end furnishings, the home was re-listed and under contract in 3 DAYS! Vacant properties don't impress potential buyers. Carolina Spaces' award winning staging will turn your cold, empty property into a showpiece that stands out against the competition! Our staging led to this property's selling success!